← Firefighter Leon Smith, Jr.
Peter Vega, 6’3”, had the nickname of “Big Head” for the obvious reason, which required a special helmet. Born in San Juan, Puerto Rico, Vega was proud of his mixed Irish and Puerto Rican heritage. His family moved to Brooklyn when he was three. “Petie” came to the FDNY after six years in the Air Force and a stint as an ironworker until the FDNY appointment came through in 1995. Vega had worked the Monday night shift. On 9/11 he managed to leave a message on his wife’s phone before Ladder 118 was called up. It said: “I’m going to the big one, I love you.” Vega was found on New Year’s Day alongside Agnello and Regan. He was identified by the yin/yang tattoo on his shoulder and the braces on his teeth. He was buried next to Cherry and Agnello in the Green-Wood Cemetery in Brooklyn. He left behind a one-year-old daughter. 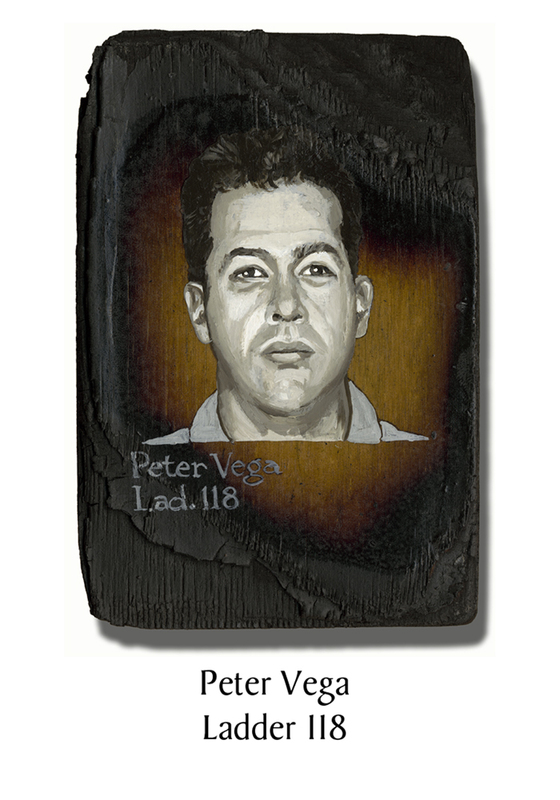 This entry was posted in Better Angels Stories and tagged 343, 9/11, better angels, Dawn Siebel, FDNY, firefighter, firefighters, firefighters of 9/11, Ladder Co. 118, LODD, Manhattan, memorial, NFFF, paintings, Peter Vega, portraits, World Trade Center, WTC. Bookmark the permalink.